TTIP is the latest bid to capture policymaking by the profit-making interests of the 1%, with dire implications for anyone who upholds a vision of a more equitable and sustainable economic order. But campaign groups and activists are working hard to expose this trade agreement for what it is, and to build an overarching global movement that can prevent this massive transfer of power to transnational corporations. As the next round of negotiations for the Transatlantic Trade and Investment Partnership (TTIP) take place in Brussels this week, civil society groups are continuing to mobilise against this ongoing free trade agreement between the U.S. and EU that poses a threat to our public services, environment, food, privacy and democracy. On Saturday, around a thousand people occupied the square in front of the European Union’s base in London, UK, and demanded an end to the trade deal that is being described by the #noTTIP coalition of activists and organisations as an unprecedented corporate power-grab. Hundreds of thousands of people have signed petitions over the last few months that call on our political representatives to provide full transparency on the negotiations and oppose this new trade offensive, which is taking place largely in secret and without any input from civil society regardless of its potentially devastating consequences. The mainstream media may be highlighting the increased economic growth and jobs that will supposedly benefit EU and U.S. economies, but in reality it represents a corporate Trojan horse that could usher in a brave new world of almost total deregulation, liberalisation and privatisation. As explained in The #noTTIP Times – a paper distributed at events held nationwide for the UK day of action – the primary aim of TTIP is not to stimulate ‘free trade’ through the removal of tariffs between the two regions, as these are already at minimum levels. Rather, the real intention is to remove the regulatory barriers that restrict the profit-making potential of multinational corporations – despite the fact that these ‘barriers’ are in fact our most prized social standards and regulations, in everything from food standards and labour rights to environmental regulations. The planned inclusion of an investor-state dispute settlement (ISDS) mechanism, otherwise known as the secret corporate courts, has received the most intense criticism. By granting corporations the right to sue governments in international arbitration tribunals over public policy decisions that ‘unfairly’ affect their bottom line, they could be empowered to overturn democratically decided laws and regulations. Through this provision, their legal status is effectively made equivalent to that of the nation state itself – making states accountable to corporations, rather than vice versa. Campaign groups have worked hard to expose this trade agreement for what it is, and to reveal the many reasons why we should all be worried about TTIP. In particular, further liberalisation of the trade in services will make it harder for governments to regulate private companies providing public services, such as in healthcare and education. And the ISDS mechanism could effectively prevent any future government from bringing these services back into public control, due to the entrenched threat of litigation. In the UK, there are already fears that this could enable the locking-in of the creeping privatisation of our schools and national health service. Furthermore, it will become far more difficult to achieve positive alternatives to corporate food systems, such as food sovereignty, due to the even greater power that will be bestowed upon major agribusiness giants. Other progressive measures in the financial sector, such as a ‘Robin Hood Tax’ on financial transactions or controls of capital flows, will also be virtually impossible to implement due to the powers that multinationals wield through the ISDS mechanism. The Jubilee Debt Campaign is even forewarning the likelihood of a new international financial crisis being created, if proposed rules for TTIP are agreed that would prevent either the EU or the U.S. from bringing in regulations on banks. TTIP is just one of three major so-called plurilateral trade agreements that are currently being negotiated among a range of countries, alongside the Trans‑Pacific Partnership (TPP) and the Trade in Services Agreement (TISA), all of which could amount to the greatest transfer of power to transnational capital that we have seen in a generation. But as the World Development Movement (WDM) and other campaigning groups make clear, TTIP is a prospective future deal between two economic superpowers that, together, will form the largest free trade zone in the world. This deal could then set a new gold standard for all future trade agreements, and if pushed through successfully it could be used to force deregulation and neoliberal economic policies on poorer countries. The implications are dire for anyone who upholds a vision of a more equitable and sustainable economic order. Not only does this new wave of trade agreements open the door to an aggressive corporate take-over of our common resources and services, but it also threatens to dramatically extend the powers of transnational capital and further hardwire ‘free market’ principles into the global economy. In short, TTIP is the latest bid to capture policymaking by the profit-making interests of the 1%, and to undermine and dismantle the established systems of economic sharing that currently exist on local, national and global levels. It remains impossible to conceive of a new economic paradigm based on sharing rather than competing for the world’s resources, so long as Trojan treaties like TTIP and TPP are promoted by our elected leaders no matter what the cost in terms of poverty, inequality and environmental destruction. Across both sides of the Atlantic, campaigners are trying to build a large scale movement that calls for a complete halt to these negotiations and similar agreements. In the words of WDM’s Nick Dearden, only a movement of the breadth and diversity of the alter-globalisation movement can bring these dangerous plans to a standstill. And there remains much hope and evidence that a conclusion of TTIP deal is far from a foregone conclusion, not forgetting the success of activists in helping to kill the Multilateral Agreement in Investment (MAI) back in 1996, or the stalling of the EU’s harmful Economic Partnership Agreements (EPAs) due in large part to the work of trade justice campaigners. Already, President Obama has been refused special powers to negotiate TTIP through Congress, while the European Commission has been forced to hold a public consultation. 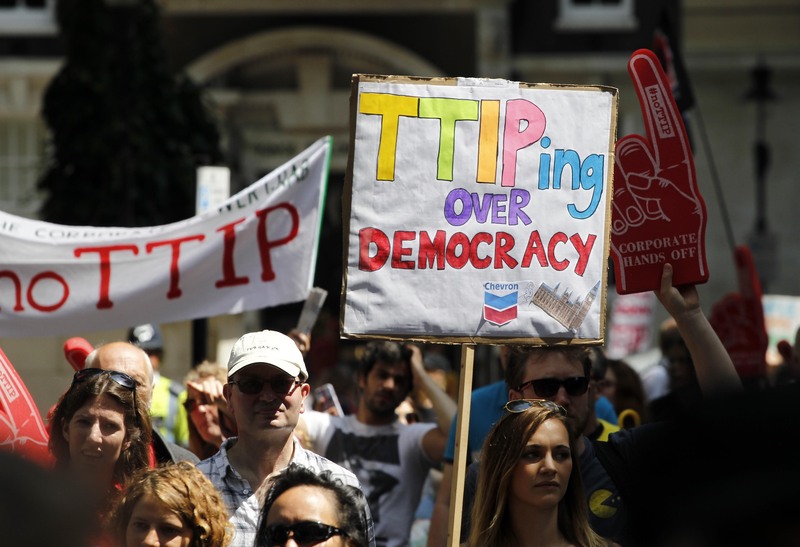 According to the #noTTIP coalition, there is everything to play for. We now need a global movement that is strong enough to stand up against corporate powers, and TTIP encompasses so many issues that activists are fighting for that it provides fertile common ground for an overarching progressive campaign. To succeed, however, the movement cannot be left to existing campaign groups and must include a broad swathe of engaged citizens who understand what is stake. Most importantly, many activists recognise that united efforts should not remain focused on a position of ‘anti’, but must also embrace alternatives that offer a new vision of a trade and investment policy that upholds the common good. The Alternative Trade Mandate has done valuable work in spelling out the principles that should underpin this vision, which sees trade as “an instrument for the equitable distribution of the world’s wealth by giving people access to resources, goods and services which are needed for the fulfilment of their needs”. In this way, the growing call for a fairer sharing of the world’s wealth, power and resources is gradually becoming a potent force for change on the international stage. Alongside the many important debates and experimentations that are currently being developed in different countries, from the commons discourse to new collaborative and co-operative economic models, there is every reason to believe that ‘we the people’ can bring about progressive social change. To be sure, the need for concerted opposition against the neoliberal agenda has never been more urgent or daunting. But at the same time, it has never been clearer that the hope for a better world rests with the solidarity, creativity and mass popular engagement of the 99%. Article: Global economic sharing: the most important debate of our time? Article: One world, one wealth?